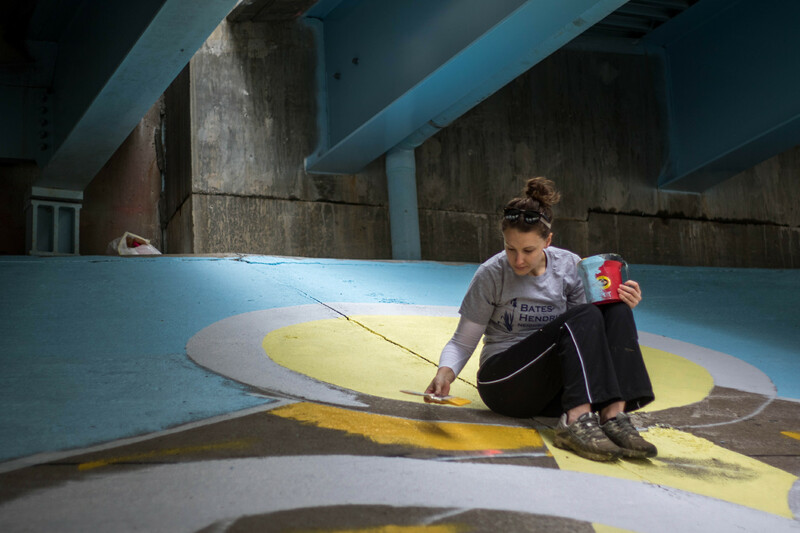 When members of the Bates-Hendricks Neighborhood Association called to ask about an underpass mural, Big Car answered. Neighborhood leaders set their sights on a stretch of Morris Street between Shelby and Leonard — the threshold between Bates-Hendricks and Fountain Square. This slanted-surface underpass bridge on the south side of Morris Street now has a colorful tableau that “talks” to the Fountain Square branded mural on the north side of Morris. Big Car Creative Director Andy Fry (a former Bates-Hendricks resident) designed a sweeping scene with a host of happy, helping neighbors — as well as the Bates-Hendricks House itself, named for Hervey Bates, Marion County’s first sheriff, and Thomas Hendricks, Governor of Indiana in the 1870’s. Over the years, civic leaders like these lived in the Italianate home, one of the oldest standing in Marion County. The Bates-Hendricks mural was painted October 31 – November 1, 2015, by a group of neighborhood residents and volunteers. See images of the mural, in-progress and completed, here.